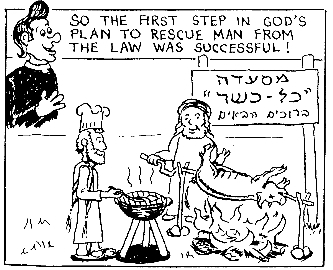 Mark 16 Ministries: Torah-The Law? Yeshua also said in John 14:15 If ye love me, keep my commandments. 1 John 5:2 -3 By this we know that we love the children of elohim, when we love Yahweh, and keep his commandments. For this is the love of Yahweh, that we keep his commandments: and his commandments are not grievous. IF WE LOVE ELOHIM, WHAT DOES HE WANT US TO DO? WHAT IS LOVE AS DEFINED BY SCRIPTURE? HOW DO WE LOVE ELOHIM? WHAT DOES LOVING ELOHIM REALLY MEAN? WHAT IS THE WHOLE RESPONSIBILITY OF MAN? Ecclesiastes 12:13 Let us hear the conclusion of the whole matter: Fear Elohim, and keep his commandments: for this is the whole duty of man. HOW IS KEEPING THE COMMANDMENTS LOVE? Matthew 22:37-40 Yeshua said unto him, Thou shalt love YHWH thy Elohim with all thy heart, and with all thy soul, and with all thy mind. This is the first and great commandment. And the second [is] like unto it, Thou shalt love thy neighbour as thyself. On these two commandments hang all the law and the prophets. HOW SHOULD WE FEEL ABOUT HIS COMMANDMENTS? Psalm 1:2 But his delight [is] in the law of YHWH; and in his law doth he meditate day and night. Proverbs 29:18 Where [there is] no vision, the people perish: but he that keepeth the law, happy [is] he. 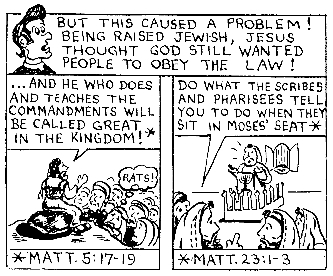 DID YESHUA ABOLISH OR REMOVE ANY COMMANDMENT FROM HIS LAW AND WHAT HAPPENS IF WE TEACH AND ACT LIKE HE DID DO SUCH A THING? Matthew 5:17-19 Think not that I am come to destroy the law, or the prophets: I am not come to destroy, but to fill up. For verily I say unto you, Till heaven and earth pass, one jot or one tittle shall in no wise pass from the law, till all be fulfilled. (law and prophets) Whosoever therefore shall break one of these least commandments, and shall teach men so, he shall be called the least in the kingdom of heaven: but whosoever shall do and teach [them], the same shall be called great in the kingdom of heaven. DID PAUL ABOLISH OR REMOVE ANY COMMANDMENT FROM THE LAW? 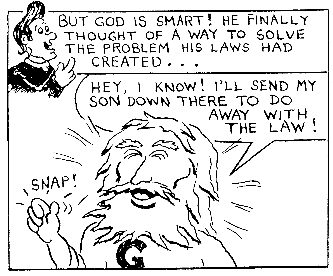 Romans 3:31 Do we then make void the law through faith? 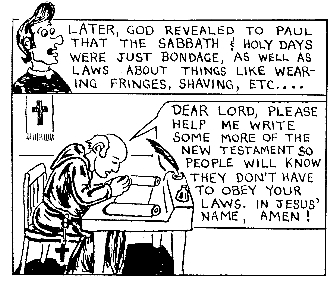 Elohim forbid: yea, we establish the law. 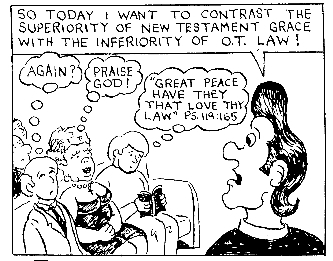 HOW DID PAUL FEEL ABOUT THE LAW? DID PAUL FOLLOW AND TEACH THE LAW OF MOSES? Acts 21:21-25 Then they said to Paul: "You see, brother, how many thousands of Jews have believed, and all of them are zealous for the law. 21They have been informed that you teach all the Jews who live among the Gentiles to turn away from Moses, telling them not to circumcise their children or live according to our customs…. Then everybody will know there is no truth in these reports about you (Paul), but that you yourself (Paul) are living in obedience to the law. DID PAUL FOLLOW AND TEACH THE LAW OF MESSIAH? Galatians 6:2 Bear ye one another's burdens, and so fulfil the law of Messiah. John 8:28 Then said Yeshua unto them, When ye have lifted up the Son of man, then shall ye know that I am he, and that I do nothing of myself; but as my Father hath taught me, I speak these things. John 8:19 Then said they unto him, Where is thy Father? Yeshua answered, Ye neither know me, nor my Father: if ye had known me, ye should have known my Father also. WHAT HAPPENS TO THOSE WHO FOLLOW THE COMMANDMENTS OF ELOHIM AND KEEP THE TESTIMONY OF YESHUA MESSIAH? Revelations 12:17 And the dragon was wroth with the woman, and went to make war with the remnant of her seed, which keep the commandments of Elohim, and have the testimony of Yeshua Messiah. Revelations 22:14 Blessed are they that do his commandments, that they may have right to the tree of life, and may enter in through the gates into the city. DID YESHUA STATE THAT RECEIVING THE SWORD OF TRUTH WOULD BRING PEACE? Matthew 10:34-38 Think not that I am come to send peace on earth: I came not to send peace, but a sword. For I am come to set a man at variance against his father, and the daughter against her mother, and the daughter in law against her mother in law. And a man's foes [shall be] they of his own household. He that loveth father or mother more than me is not worthy of me: and he that loveth son or daughter more than me is not worthy of me. And he that taketh not his cross, and followeth after me, is not worthy of me. WHAT DOES THE SWORD DO TO PEOPLE? Hebrews 4:12 For the word of Elohim [is] quick, and powerful, and sharper than any two edged sword, piercing even to the dividing asunder of soul and spirit, and of the joints and marrow, and [is] a discerner of the thoughts and intents of the heart. WHAT DID YESHUA STATE WOULD HAPPEN IF WE FOLLOW HIS COMMANDMENTS AND WALK IN HIS PATH? Revelations 14:12 Here is the endurance of the saints: here are they that keep the commandments of Elohim, and the faith of Yeshua. HOW DO WE KNOW IF WE KNOW HIM? 1 John 2:3-6 And hereby we do know that we know him, if we keep his commandments. He that saith, I know him, and keepeth not his commandments, is a liar, and the truth is not in him. But whoso keepeth his word, in him verily is the love of Elohim perfected: hereby know we that we are in him. He that saith he abideth in him ought himself also so to walk, even as he walked. SHOULD BELIEVERS DO WHAT IS RIGHT IN OUR OWN EYES AND FOLLOW AFTER OUR OWN HEART OR SHOULD WE JUST SIMPLY FOLLOW HIS COMMANDMENTS? Ecclesiastes 11:9 Rejoice, young man, during your childhood, and let your heart be pleasant during the days of young manhood. And follow the impulses of your heart and the desires of your eyes. Yet know that Elohim will bring you to judgment for all these things. Numbers 15:39 Seek not after your own heart and your own eyes. SHOULD WE BE CAREFUL NOT TO ADD OR TAKE AWAY FROM HIS COMMANDMENTS? Deuteronomy 4:2 Ye shall not add unto the word which I command you, neither shall ye diminish [ought] from it, that ye may keep the commandments of YHWH your Elohim which I command you. 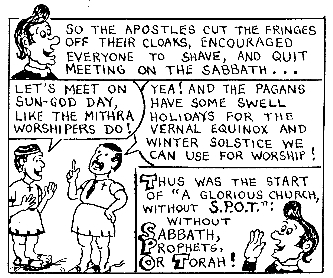 SHOULD WE SERVE, WORSHIP, AND REMEMBER YHWH IN THE SAME WAYS THAT FALSE GODS HAVE BEEN WORSHIPPED AND REMEMBERED? 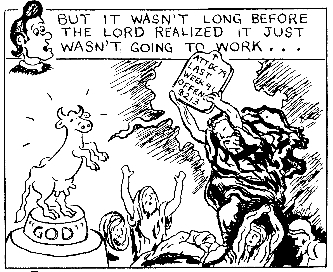 Jeremiah 10:2-5 Thus saith YHWH, Learn not the way of the heathen, and be not dismayed at the signs of heaven; for the heathen are dismayed at them. For the customs of the people [are] vain: for [one] cutteth a tree out of the forest, the work of the hands of the workman, with the axe. They deck it with silver and with gold; they fasten it with nails and with hammers, that it move not. They are upright as the palm tree, but speak not: they must needs be borne, because they cannot go. Be not afraid of them; for they cannot do evil (harm you), neither also is it in them to do good. Deuteronomy 12:4 You must not worship YHWH your Elohim in their way. WILL HE HAVE THE SAME COMMANDMENTS DURING HIS REIGN WHEN HE RETURNS? Isaiah 2:2-4 And it shall come to pass in the last days, [that] the mountain of YHWH's house shall be established in the top of the mountains, and shall be exalted above the hills; and all nations shall flow unto it. And many people shall go and say, Come ye, and let us go up to the mountain of YHWH, to the house of the Elohim of Jacob; and he will teach us of his ways, and we will walk in his paths: for out of Zion shall go forth the law, and the word of YHWH from Jerusalem. And he shall judge among the nations, and shall rebuke many people: and they shall beat their swords into plowshares, and their spears into pruning hooks: nation shall not lift up sword against nation, neither shall they learn war any more. CAN WE BE CORRUPTED OR SPOILED BY MAN'S PHILOSOPHY, TRADITIONS, AND PRINCIPLES OF THE WORLD? Colossians 2:8 Beware lest any man spoil you through philosophy and vain deceit, after the tradition of men, after the rudiments of the world, and not after Messiah. 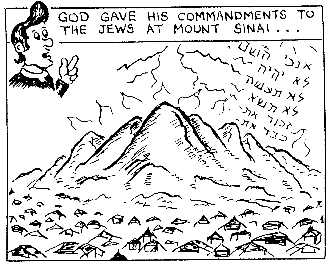 DID ABRAHAM ALREADY HAVE THE LAW AND COMMANDMENTS OR WAS THE LAW A NEW INVENTION AT MOUNT SINAI? ARE WE HEIRS OF ABRAHAM’S PROMISE IF WE ARE OF MESSIAH? Galatians 3:29 And if ye be Messiah's, then are ye Abraham's seed, and heirs according to the promise. IF WE ARE HEIRS OF THE PROMISE OF ABRAHAM, ARE WE TO FOLLOW THE LAWS AND COMMANDMENTS LIKE ABRAHAM DID? John 8:39 They answered and said unto him, Abraham is our father. 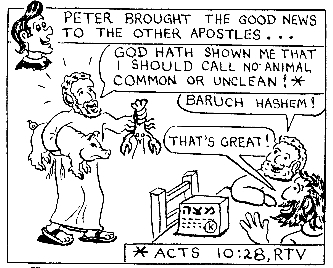 Yeshua saith unto them, If ye were Abraham's children, ye would do the works of Abraham. Revelations 22:12 And, behold, I come quickly; and my reward [is] with me, to give every man according as his work shall be. IF LETTING OUR LIGHT SHINE IS GOOD WORKS WHICH EARNS OUR REWARDS/CROWNS, WHAT IS THE LIGHT THAT WE SHOW BEFORE MEN? WHO IS THE BEST EXAMPLE OF HOW TO WALK IN THE LIGHT, YHWH’s COMMANDMENTS AND LAW, OUR WAY OF LIFE? John 8:12 Then spake Yeshua again unto them, saying, I am the light of the world: he that followeth me shall not walk in darkness, but shall have the light of life. WHY DID YESHUA CONSIDER HIMSELF TO BE THE LIGHT? SHOULD WE WALK AS YESHUA WALKED AND FOLLOW THE WORD AS YESHUA FOLLOWED THE WORD? HOW DO WE PERFECT OUR FAITH? IS IT POSSIBLE FOR WORKS TO PLEASE ELOHIM WITHOUT FAITH? Hebrews 11:6 But without faith it is impossible to please him: for he that cometh to Elohim must believe that he is, and that he is a rewarder of them that diligently seek him. 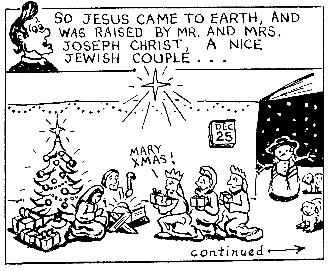 AFTER WE REALIZE THAT YESHUA IS THE ONE, WHAT DID YESHUA SAY WE NEED TO CONTINUE TO DO IN ORDER TO HAVE ETERNAL LIFE? Matthew 19:16-17 And, behold, one came and said unto him, Good Master, what good thing shall I do, that I may have eternal life? And he said unto him, Why callest thou me good? there is none good but one, that is, Elohim: but if thou wilt enter into life, keep the commandments. WHAT DID YESHUA STATE THAT WE ARE TO DO IN ORDER TO HAVE THE RIGHT TO THE TREE OF LIFE? Revelations 22:14 Blessed are they that do His (YHWH’s) commandments, that they may have right to the tree of life, and may enter in through the gates into the city. 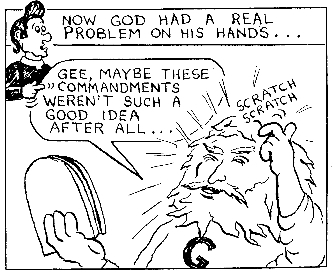 ARE ANY PARTS OF THE LAW OR ANY COMMANDMENTS IN SCRIPTURE NOT HOLY, GOOD, OR JUST? IS THE PATH OR THE WAY OF LIFE (THE LIGHT/THE WORD) BROAD OR NARROW AND IS IT FEW OR MANY THAT FIND IT? ARE WE TO BE CAUTIOUS OF FALSE PROPHETS AND DO FALSE PROPHETS APPEAR LIKE BELIEVERS ON THE SURFACE? HOW WILL WE KNOW FALSE PROPHETS? Matthew 7:16-20 Ye shall know them by their fruits. Do men gather grapes of thorns, or figs of thistles? Even so every good tree bringeth forth good fruit; but a corrupt tree bringeth forth evil fruit. A good tree cannot bring forth evil fruit, neither [can] a corrupt tree bring forth good fruit. Every tree that bringeth not forth good fruit is hewn down, and cast into the fire. Wherefore by their fruits ye shall know them. WHAT IS GOOD FRUIT THAT BELIEVERS BRING FORTH? John 15:8-10 Herein is my Father glorified, that ye bear much fruit; so shall ye be my disciples. As the Father hath loved me, so have I loved you: continue ye in my love. If ye keep my commandments, ye shall abide in my love; even as I have kept my Father's commandments, and abide in his love. 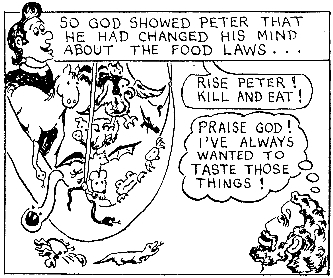 WILL THERE BE PEOPLE THAT THOUGHT THEY WERE BRINGING FORTH GOOD FRUIT BUT ACTUALLY WERE BRINGING FORTH CORRUPT FRUIT? WHAT IS THE FATHER’S WILL AND WHAT IS INIQUITY? Leviticus 5:17 And if a soul sin, and commit any of these things which are forbidden to be done by the commandments of YHWH; though he wist it not, yet is he guilty, and shall bear his iniquity. HOW DO WE KNOW THAT WE KNOW HIM AND ARE IN HIM? 1 John 2:3-5 And hereby we do know that we know him, if we keep his commandments. He that saith, I know him, and keepeth not his commandments, is a liar, and the truth is not in him. But whoso keepeth his word, in him verily is the love of Elohim perfected: hereby know we that we are in him. WHO REDEEMED US FROM INIQUITY? SHOULD WE HAVE FAITH, COMMIT, TRUST AND BELIEVE AND HOW WILL WE ACT AND WHAT WILL WE BE IF WE ARE TRULY HIS PEOPLE? Titus 2:13-14 Looking for that blessed hope, and the glorious appearing of the great Elohim and our Saviour Yeshua Messiah. Who gave himself for us, that he might redeem us from all iniquity, and purify unto himself a peculiar people, zealous of good works. WHEN THE MANY FALSE PROPHETS ARISE WHAT WILL HAPPEN? Matthew 24:11-12 And many false prophets shall rise, and shall deceive many. And because iniquity shall abound, the love of many shall wax cold. WILL THESE FALSE PROPHETS SPEAK OF YHWH'S WAYS, THE WAY OF TRUTH, AS EVIL? 2 Peter 2:1-2 But there were false prophets also among the people, even as there shall be false teachers among you, who privily shall bring in damnable heresies, even denying the Master that bought them, and bring upon themselves swift destruction. And many shall follow their pernicious ways; by reason of whom the way of truth shall be evil spoken of. SINCE INIQUITY IS SIN, WHY DO PEOPLE LET THESE NUMEROUS FALSE PROPHETS CAUSE OTHERS AND THEMSELVES TO SIN? 2 Timothy 4:2-4 Preach the word; be instant in season, out of season; reprove, rebuke, exhort with all longsuffering and doctrine. For the time will come when they will not endure sound doctrine; but after their own lusts shall they heap to themselves teachers, having itching ears; And they shall turn away their ears from the truth, and shall be turned unto fables. WHAT IS THE WAY OF TRUTH THAT WILL BE SPOKEN OF AS EVIL BY FALSE PROPHETS? Daniel 9:13 As it is written in the law of Moses, all this evil is come upon us: yet made we not our prayer before YHWH our Elohim, that we might turn from our iniquities, and understand thy truth. IF YESHUA WAS THE WORD MADE FLESH AND THE LAW IS THE TRUTH, IS YESHUA THE TRUTH? John 14:5-7 Thomas saith unto him, Lord, we know not whither thou goest; and how can we know the way? Yeshua saith unto him, I am the way, the truth, and the life: no man cometh unto the Father, but by me. If ye had known me, ye should have known my Father also: and from henceforth ye know him, and have seen him. IF YESHUA IS THE TRUTH, WHICH IS ALSO THE WORD AND LAW, WHAT IS THE LIFE AND THE WAY? Proverbs 13:13-15 Whoso despiseth the word shall be destroyed: but he that feareth the commandment shall be rewarded. The law of the wise is a fountain of life, to depart from the snares of death. Good understanding giveth favour: but the way of transgressors is hard. IF YESHUA IS THE LIGHT, THE TRUTH, THE LIFE, THE WAY THAT WE SHOULD WALK, DID PAUL ALSO BELIEVE THAT THE LAW AND PROPHETS WAS THE WAY? Acts 9:2 And desired of him letters to Damascus to the synagogues, that if he found any of the Way, whether they were men or women, he might bring them bound unto Jerusalem. Acts 19:9 But when divers were hardened, and believed not, but spake evil of the Way before the multitude, he departed from them, and separated the disciples, disputing daily in the school of one Tyrannus. Acts 19:23 And the same time there arose no small stir about the Way. HOW SHOULD WE RESPOND TO OTHERS WITH THE TRUTH? Proverbs 9:8 Do not correct a scoffer, lest he hate you; Rebuke a wise man, and he will love you. Jude 1:3…contend earnestly for the faith which was once for all delivered to the saints. DO WE NEED MEN TO TEACH US HOW TO UNDERSTAND SCRIPTURE? In summary, we need to take a look at the scriptures in a way that allows the scriptures to speak for themselves. Let's lay aside our man made religion (passed down to us in ignorance) and let's take a closer look at what the Scriptures REALLY say. 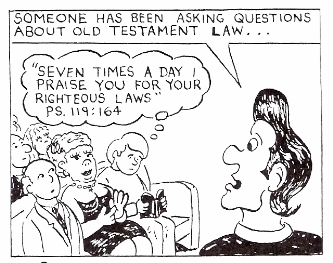 The following comic addresses several issues that have become a major problem in some of today's churches. 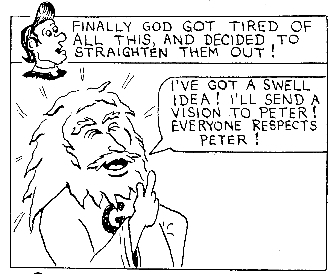 Comics were reprinted from Gates of Eden, P.O. Box 2257, East Peoria, IL 61611-0257. Write for a sample copy or for information about the Rev. 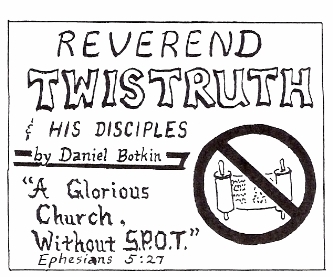 Twistruth comic book. Yeshua said in Matthew 5:17-19 Think not that I am come to destroy the Torah, or the prophets: I am not come to destroy, but to fulfil. For verily I say unto you, Till heaven and earth pass, one jot or one tittle shall in no wise pass from the Torah, till all be fulfilled. Whosoever therefore shall break one of these least commandments, and shall teach men so, he shall be called the least in the kingdom of heaven: but whosoever shall do and teach them, the same shall be called great in the kingdom of heaven.